To Cite: Geng N, Xin Y, Xia H H, Jiang M, Wang J, et al. Association of PNPLA3 I148M Variant With Chronic Viral Hepatitis, Autoimmune Liver Diseases and Outcomes of Liver Transplantation, Hepat Mon. 2015 ; 15(4):e26459. doi: 10.5812/hepatmon.15(4)2015.26459. Context: The PNPLA3 I148M variant has been recognized as a genetic determinant of liver fat content and a genetic risk factor of liver damage progression associated with steatohepatitis. The I148M variant is associated with many chronic liver diseases. However, its potential association with inflammatory and autoimmune liver diseases has not been established. Evidence Acquisition: We systemically reviewed the potential associations of I148M variant with chronic viral hepatitis, autoimmune liver diseases and the outcome of liver transplantation, explored the underlying molecular mechanisms and tried to translate them into more individualized decision-making and personalized medicine. Results: There were associations between I148M variant and chronic viral hepatitis and autoimmune liver diseases and differential associations of I148M variant in donors and recipients with post-liver transplant outcomes. I148M variant may activate the development of steatosis caused by host metabolic disorders in chronic viral hepatitis, but few researches were found to illustrate the mechanisms in autoimmune liver diseases. The peripherally mediated mechanism (via extrahepatic adipose tissue) may play a principal role in triglyceride accumulation regardless of adiponutrin activity in the graft liver. Conclusions: Evidences have shown the associations between I148M variant and mentioned diseases. I148M variant induced steatosis may be involved in the mechanism of chronic viral hepatitis and genetic considered personalized therapies, especially for PSC male patients. It is also crucial to pay attention to this parameter in donor selection and prognosis estimation in liver transplantation. In 2008, a Single Nucleotide Polymorphism (SNP) in the patatin-like phospholipase domain-containing 3 (PNPLA3, adiponutrin) gene or rs738409 polymorphism was reported to be significantly associated with liver fat content (1). This SNP represents a substitution from cytosine to guanine, resulting in a switch from isoleucine to methionine at residue 148 (I148M). Since then, extensive investigation on the association between PNPLA3 I148M or rs738409 polymorphism and liver diseases has been performed. Various studies revealed that the PNPLA3 I148M variant is associated with development and progression of liver disease, including non-alcoholic fatty liver disease (NAFLD) (2-4), alcoholic fatty liver disease (5) as well as susceptibility to hepatocellular carcinoma (HCC) (6, 7). However, its association with other inflammatory and autoimmune liver diseases has not been fully elucidated. Whether there is an association between the PNPLA3 I148M variant and chronic viral hepatitis and autoimmune liver diseases, and whether PNPLA3 I148M variant plays a role in liver transplantation has not been established, although some studies addressed these issues and demonstrated potential associations. Moreover, the mechanisms by which PNPLA3 I148M variant may be involved in development and progression of these diseases are largely unclear. Therefore, the aim of this article was to systematically review the current knowledge on the association between PNPLA3 I148M variant and chronic viral hepatitis and autoimmune liver diseases and its possible role in liver transplantation. The aim was also to explore underlying molecular mechanisms and translate them into more individualized decision-making and personalized medicine. We systemically reviewed potential associations of I148M variant with chronic viral hepatitis, autoimmune liver diseases and the outcome of liver transplantation. All references were extracted from sources such as PubMed, EMBASE and other databases with keywords “PNPLA3 I148M”, "hepatitis C", "HCV", "hepatitis B", "HBV", “autoimmune liver diseases”, “autoimmune hepatitis”, “primary sclerosing cholangitis”, “PSC” and “primary biliary cirrhosis”, “PBC” and “Liver Transplantation”. Hepatic steatosis is a common symptom in patients with chronic hepatitis C (CHC) (8) and associated with severe fibrosis (9) and a low rate of sustained virological responses (SVR) to antiviral therapy (10). Moreover, steatosis is thought to be a possible risk factor of the development of HCC in hepatitis C virus (HCV) infection (11, 12). In 2011, Valenti et al. reported the first study on the association between PNPLA3 I148M variant and CHC (13). The group analyzed two independent series of 325 and 494 CHC patients in Italy and found that the I148M variant was associated not only with liver steatosis, but also with fibrosis (13). At the same time, Trepo et al. in a study of 537 Caucasian CHC patients in Belgium, Germany and France, observed that PNPLA3 I148M variant favored steatosis and fibrosis progression in CHC (14). Recent studies indicated that the PNPLA3 I148M variant is a risk factor of fibrosis progression in CHC (15, 16). An increased association of the I148M variant with steatosis has been observed, especially in HCV infection with non-3 genotypes (17, 18) or in CHC patients with excessive abdominal fat (19). In the study by Zampino et al. (19) the waist circumference, which is highly correlated with visceral adipose tissue in children, adolescents and adults (20), increased the association of the I148M variant with liver steatosis. The group suggested a simple method to modulate the development of liver steatosis in CHC patients, healthy eating and moderate exercise to control body weight. At present, the influence of PNPLA3 polymorphism on SVR remains controversial. On one hand, Valenti et al. reported that CHC patients with the I148M variant, who accounted for 10% of the patients, had a roughly 50% higher risk of cirrhosis than other PNPLA3 genotypes, and the I148M variant was significantly associated with a lower SVR rate in patients with genotype 1 and 4 HCV infection (13). Moreover, Valenti L et al. (21) reported this association between I148M variant and SVR in patients with genotype 1 and 4 HCV and bridging fibrosis, whereas there was no association in patients with genotypes 1 and 4 HCV without bridging fibrosis or in those with genotypes 2 and 3 HCV. On the other hand, Trepo et al. (14) observed no association between PNPLA3 and SVR. Clark and colleagues (22) also did not observe any association between the PNPLA3 I148M variant and SVR, although they further demonstrated the association between the PNPLA3 I148M variant and severe steatosis in patients with previously untreated genotype 1 HCV infection. This finding was confirmed by a recent Japanese study (23). These studies with negative results suggest that metabolic steatosis, rather than genetic steatosis, may be the possible mechanism of low SVR rate during antiviral therapy (24). Therefore, further investigations are required regarding the association between the PNPLA3 I148M variant and SVR to understand the mechanisms for treatment failure in patients undergoing antiviral therapy on the genetic level to improve diagnosis and treatment based on genetic risk stratification. In their first study of this genetic polymorphism in CHC, Valenti et al. demonstrated an association of the PNPLA3 I148M variant with hepatocarcinogenesis (13), which was confirmed by others (25, 26). In 2013, Guyot et al. (27) observed that the PNPLA3 I148M variant was associated with an increased occurrence of HCC in patients with HCV-associated cirrhosis. In 2014, Sato et al. (28) reported that the PNPLA3 I148M variant accelerated hepatocarcinogenesis in CHC, which was determined by genotyping PNPLA3 in 358 hepatitis HCV-associated HCC patients. These findings all indicate the crucial role of the PNPLA3 I148M variant in hepatocarcinogenesis in CHC patients. Thus, taking this genetic factor into consideration would assist in creating a reasonable therapeutic strategy to prevent future development of HCC in CHC patients. In patients with Chronic Hepatitis B (CHB), steatosis also represents a common histopathological feature (29, 30). It is not only associated with severe fibrosis, but also with CHB progression (30, 31). Whether host genetic factors contribute to the pathogenesis of steatosis in CHB remains unknown. Vigano et al. demonstrated that PNPLA3 148M polymorphism was an independent predictor of severe steatosis in Italian patients with biopsy-proven-CHB (32). However, this variant was not associated with CHB or HBV-related cirrhosis (33, 34). It has been postulated that lipid metabolism acts as a crucial factor in steatosis development. Disruption of lipid metabolism in CHC is reported to be viral genotype-specific (35-37), whereas, viral factors play a predominant role in the development of steatosis (36) in genotype 3 HCV infection, host metabolic disorders are the major determinants of hepatic steatosis in non-3 genotype HCV infection (37). To understand the possible role of PNPLA3 in viral factor-mediated steatosis, one needs to understand the importance of lipid metabolism in viral packaging. Lipids play a crucial role in the life cycle of HCV (38), for example, HCV escapes immune clearance and establishes persistent infection through host lipid metabolism (39). Thus, HCV has a unique feature; its assembly step is implicated in the host's lipid metabolism (40). It has been demonstrated that intracellular distribution of lipid droplets (LDs), which plays an important role in the deposition of triglyceride and cholesterylesters (41), changes profoundly in HCV infection (42). Moreover, virus assembly is drastically impaired when the interaction of HCV core protein with LDs is prevented (43). The PNPLA3 I148M variant has been shown to be associated with lipid metabolism in many chronic liver diseases and over 90% of the PNPLA3 protein are located in LDs in hepatocytes (44). A recent study demonstrated that the I148M variant increased LD development and functions (45), indicating that the I148M variant may play a role in CHC-associated steatosis through this virus-induced pathway (39), although this possible mechanism needs to be further investigated. The PNPLA3 I148M variant participates in host metabolic disorders as well. The association of the PNPLA3 I148M variant with steatosis or fibrosis is stronger in non-3 genotype HCV infection than in genotype 3 HCV infection, supporting the important role of host metabolic factors in CHC and CHB (17, 18, 34). Recently, Sato et al. (28) suggested that the PNPLA3 I148M variant may be involved in hepatocarcinogenesis by inducing steatosis in the liver in CHC, as the PNPLA3 I148M variant has been identified as a risk factor of steatosis-mediated liver damage and fibrosis progression. 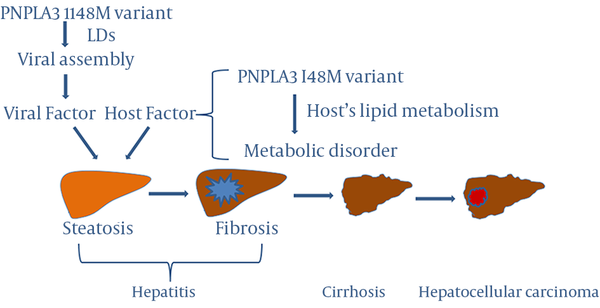 Based on available findings, we hypothesize the possible mechanisms by which the PNPLA3 I148M variant plays an important role in the development and progression of liver diseases in chronic hepatitis (Figure 1). As stated above, the presence of steatosis is an essential factor in historic progression of viral hepatitis and viral features, such as genotypes and viral load play no role in the association between PNPLA3 I148M variant and liver disease, indicating that host metabolic disorders rather than viral factors are the leading cause of steatosis in either CHC or CHB (21, 32, 46). Thus, it is hypothesized that viral and host factors are involved in the main mechanisms of development of steatosis in hepatitis and the PNPLA3 I148M variant may participate in the mechanisms (Figure 1). However, further investigation is required regarding the underlying molecular mechanisms by which PNPLA3 I148M polymorphism plays an important role in viral hepatitis and development and progression of liver diseases such as steatosis, fibrosis, cirrhosis and HCC in chronic hepatitis to confirm the proposed hypothesis. Autoimmune liver diseases mainly include autoimmune hepatitis, Primary Sclerosing Cholangitis (PSC) and primary biliary cirrhosis (PBC) (47). They are cryptogenic liver diseases and recent articles reported the rare cases with them (48-50). Autoimmune hepatitis with biliary tract involvement is always seen in PSC and PBC (51, 52). Studies of the association of the PNPLA3 I148M variant with autoimmune liver diseases are scarce. A recent study showed that (53) the PNPLA3 I148M variant affects the disease course of PSC and significantly decreased the actuarial survival rate free of liver transplantation in PSC patients with severe bile duct strictures. Interestingly, the study further demonstrated that the association between this variation and PSC followed a gender-specific pattern; the effect of I148M variant on actuarial survival was shown only in male, but female, PSC patients. This finding supports a previous report demonstrating a gender-specific pattern, suggesting a sexual dimorphism of the PNPLA3 I148M variant in NAFLD development (54). This preliminary study suggested that genetic testing for the PNPLA3 I148M variant is recommended due to the high risk of PNPLA3 I148M variant in PSC male patients, to improve diagnosis and subsequent therapies. Such an individualized decision-making and personalized medicine approach, including risk stratification, surveillance strategies and liver transplant allocation, may be an optimal choice of management, especially for male PSC patients. This study paved a new avenue for studying the role of the PNPLA3 I148M variant in autoimmune liver diseases; however, additional studies are needed to further elucidate the role of this variant in autoimmune liver diseases. End-stage of liver disease is the most important indication for liver transplantation (55, 56) and the outcome of liver transplantation, especially its complications affects patients’ quality of life (57). It is worthwhile to investigate the association of the PNPLA3 I148M variant with the outcome of liver transplantation. CHC is the most common reason for liver transplantation in Western countries (58). In 2011, a preliminary study suggested that the PNPLA3 I148M variant in transplant recipients was not associated with recurrent HCV fibrosis progression (59). However, the study did not take the donors’ PNPLA3 genotype into consideration. A recent study showed that the PNPLA3 I148M variant in the donors, rather than the recipients, was a risk predictor of poor post-Liver Transplant (LT) outcomes (i.e. increased risk of fibrosis progression, re-transplantation, or death) in CHC (60), indicating that liver rather than adipose tissue, was the exact site where this effect occurs and the donor genotype should also be a considerable factor for HCV-related liver transplantation. Thus, the ability to identify donors’ genotype would help care providers assess the graft and establish a post-LT fibrosis progression management plan before and after transplantation, respectively. Dunn et al. reported that (60) the PNPLA3 I148M variant in donors promoted fibrosis progression, but the group did not observe an association between the PNPLA3 I148M variant, neither of donors nor of recipients, with post-LT hepatic steatosis. However, in the study by Finkenstedt et al. (61), the PNPLA3 I148M variant of the recipients, rather than the donors, was associated with post-LT steatosis. The findings of these two studies indicate that PNPLA3-mediated fibrosis progression and steatosis in HCV-related liver transplant patients might occur through separate pathways, although further investigation is needed to confirm the speculation. Couto et al. suggested that the reason for higher post-LT metabolic syndrome and diabetes mellitus in Hispanic patients was associated with genetic differences caused by the PNPLA3 I148M variant (62). Another recent study showed that the recipient PNPLA3 I148M variant, rather than the donors’ genotype, was independently associated with post-LT obesity; combined with the IL28B TT genotype, this variant was predictive of diabetes mellitus/impaired fasting glucose (IFG) (63). A recent letter by Karlas et al. reported that (64) the PNPLA3 I148M variant of recipients was not only associated with post-LT steatosis, but also with post-LT diabetes mellitus. Lack of donor-related risks for post-LT metabolic disorders indicates that the peripherally mediated mechanism (via extrahepatic adipose tissue) may play a principal role in triglyceride accumulation regardless of adiponutrin activity in the graft liver (62-64). Taken together, these findings suggest that identification of patients with high risk for post-LT metabolic syndrome and diabetes mellitus before LT would help physicians make aggressive weight management plans in advance before and after operation. The PNPLA3 I148M variant is associated with chronic viral hepatitis, mainly via development of steatosis caused by host metabolic disorders. Since the I148M variant was associated with hepatocarcinogenesis in CHC patients, taking I148M variant factor into consideration would assist in creating a reasonable therapeutic strategy to prevent future development of HCC in CHC patients. There is a male gender-specific association between the PNPLA3 I148M variant and PSC with severe bile duct strictures. However, additional studies are needed to further elucidate the associations and the role of this variant in autoimmune liver diseases not only in PSC, but also in autoimmune hepatitis and primary biliary cirrhosis. The associations of PNPLA3 I148M polymorphism in donors or recipients and post-LT outcomes are listed in Table 1. Generally, PNPLA3 I148M variant of the donors, rather than the recipients, is a risk predictor of poor post-LT outcomes in HCV, including fibrosis progression or even a high re-transplant rate. In contrast, PNPLA3 I148M variant of the recipients, rather than the donors, is associated with post-LT metabolic disorders, including steatosis, obesity or diabetes mellitus/IFG. Recently, Dunn et al. reported that the PNPLA3 I148M variant did not increase post-LT mortality, despite the risk of this genotype for many severe liver diseases (60). However, further investigation is required to determine whether the PNPLA3 148M variant is associated with prognosis of liver transplantation. Evidences have shown associations between I148M variant and chronic viral hepatitis, autoimmune liver diseases and the outcome of liver transplantation and these could provide clues for personalized therapies, especially for PSC male patients and in donor selection and prognosis estimation in liver transplantation. Additional studies are needed to further illustrate the mechanisms of I148M variant in chronic liver disease. We would like to thank the Qingdao Municipal Hospital for their supports. Financial Disclosure: Yong-Ning Xin, Man Jiang and Shi-Ying Xuan reported receiving research grants and honoraria from Qingdao Municipal Hospital. Funding/Support: This review was supported by the National Natural Science Foundation of China (NSFC, No. 81170337 (http://www.nsfc.gov.cn/).